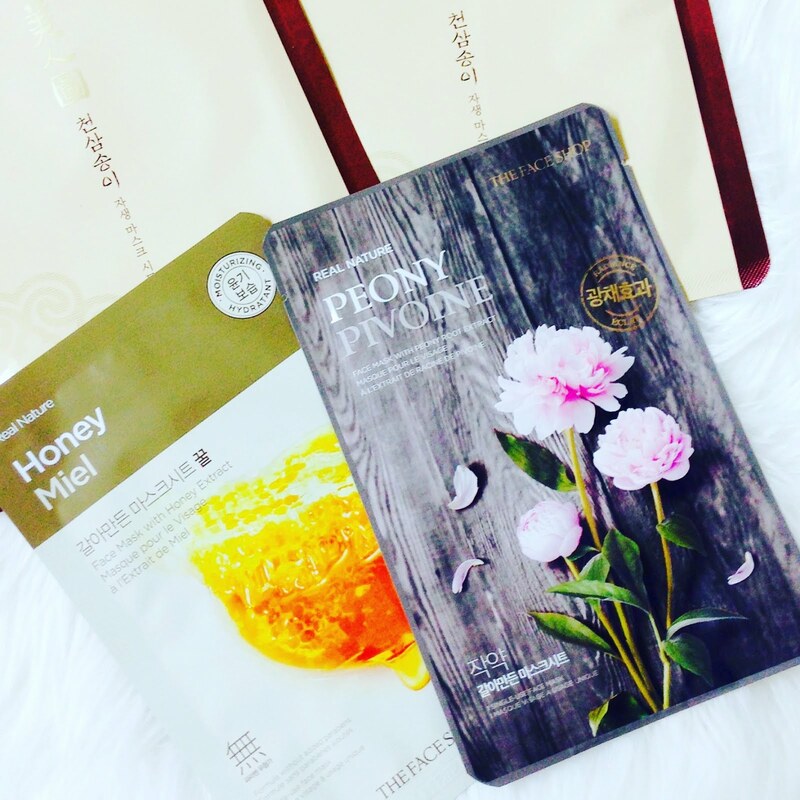 KOREAN SHEET MASKS – MY SKIN CARE GAME CHANGER! Korean sheet masks are all the rage now! Well it’s been all the rage for the past year, I just happened to hop on this beauty “trend” a tad late…it’s still hot though! It turns out many of you are just as curious about the Korean sheet masks as I am. Well here’s what I researched about them. The sheet mask beauty regime originated from Korea ( duh!) and is used by almost everyone from women, men, celebrities, to teenagers so basically everyone around the globe.! Sheet masks are individually wrapped and target different skin concerns such as dullness, firmness,acne, hydration and wrinkles. The individually wrapped sheets are super convenient , affordable ( $5 – $8) and in a 15-40 minute period can give you glowing healthy looking skin. This is because the sheets are dripping with serums/gels that are loaded with antioxidants and natural ingredients to address your skin woes. Some sheets are single sheets and others come in 2 parts, 1 for the upper face ( eyes) and another for the lower face ( nose , jaw,cheeks). Some sheets are single use ( meaning you use it once and toss it ) and others you can use again ( 2 times max). The sheets adhere to your face and stay put for the duration required. Warning: The images you are about to see are frightening! Approach with caution! I tried my first Korean mask last night. It was the Myeonghan Miindo Heaven Grade Ginseng Mask Sheet ( reusable) that I purchased from THE FACE SHOP for $5. It contains Ginseng and 24K gold hydro gel to help fight wrinkles, hydrate and brighten skin tone. Yes, I look hideous! I know! It was a 2 part sheet mask ( 1 upper and 1 lower). As this was my first sheet mask experience I didn’t properly adhere the mask to my face as you can tell. 4 minutes in to the treatment I read the back of the packaging and I was supposed to pat the sheet lightly for full absorption to the face. The mask felt very soothing and gooey on my face at first. There was no tingling sensation just a soothing one. After 40 minutes, as per the recommended usage, I peeled the sheet off and gently put it back into the packaging as I can reuse the other side of the mask the next day. This is my skin after removing the sheet mask. I did instantly notice the dry patch on the sides of my nose and my jawline was gone, that surprised me! I loved how smooth my skin felt and YES my skin was illuminating! I have other sheet masks also purchased from THE FACE SHOP such as Honey and Peony to try next week. I’m impressed with how easy it is to use these masks and I’m loving the instant results. This definitely is a game changer for me as I’ve seen amazing results on my friends from daily use (even twice a week is beneficial) and I’m excited to achieve the same results. The Korean sheet mask “trend” isn’t going anywhere any time soon. There is a whole industry built around these convenient packages and I definitely see why. They are budget friendly and offer a variety of ingredients to target your specific skin concerns. As for me, this will change my skin care game! I’m experiencing a lot of issues with the skin dryness lately and I was on the hunt for a budget friendly alternative and I hope I found it! Have you tried these masks? If so , comment below. I’ld love to hear from you! Disclaimer: I purchased the products with my own money. I was not gifted the sheet masks and I was not compensated for the post. The opinions expressed are my own. I am not affiliated with THE FACE SHOP. There was this joke in Soviet Union about freedom, "an American tells to a Russian, ''we have freedom! I can go to the White House and shout out 'Reagan is a stupid fool!' ''. Yes, yes, replies the Russian, we have freedom too! I too can go to the Red Square and shout out: 'Reagan is a stupid fool!' "Kinda what moronicliberals do today with their allowed groupthink recitations which replaces free thinking for them.